If neither of those appeals to you, don’t worry — there are many, many options out there for coloring stress relief (or just for fun) — in fact, it’s almost overwhelming. You can find coloring books of mandalas, animals, flowers and landscapes, fashion, abstract designs, tattoos, TV and movies (from Bob’s Burgers to Buffy to Lord of the Rings), lawyers, architecture, sports, quotes, Internet-famous cats, and anatomy. 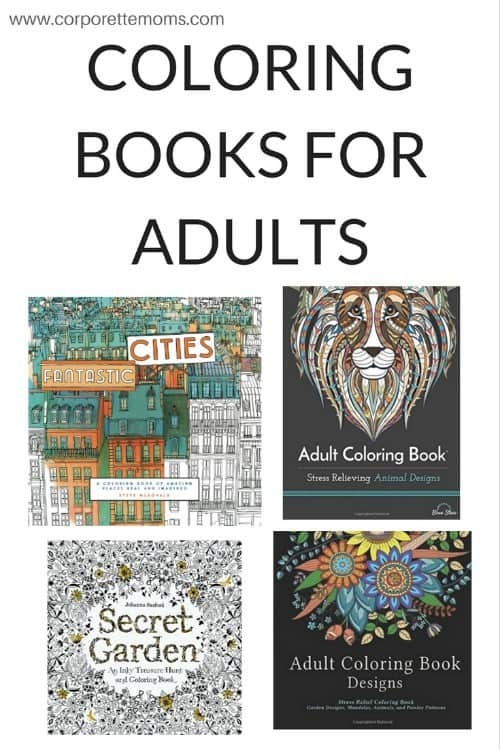 There are religious coloring books, coloring books of Disney villains and Disney princesses, and several books with titles like Calm the F*ck Down: An Irreverent Adult Coloring Book (which has 800+ reviews). Your favorite website may have even put out its own coloring book, for example, The Oatmeal or Young House Love. Adult Coloring Book Designs: Stress Relief. This book offers gardens, animals, mandalas, and paisley designs to color. Amazon, $4.77. Secret Garden: An Inky Treasure Hunt and Coloring Book. This one contains pen-and-ink illustrations of gardens that feature hidden pictures of “tiny garden creatures” to find. Amazon, $9.57. Adult Coloring Book: Stress Relieving Animal Designs. This coloring book features more than 40 animal pictures to color. Amazon, $11.69. Fantastic Cities: A Coloring Book of Amazing Places Real and Imagined. This book features illustrations of New York, London, Paris, Rio, Tokyo, and other cities. Amazon, $12.08. Do you like coloring? Do you use it as a stress reliever, creative outlet, or both? What tools do you use for coloring — pencils, markers, gel pens, or something else? Which coloring books are your favorites? Or, do you prefer other types of art such as drawing or painting? This may call my adult status into question, but I’ve received a number of those adult coloring books as gifts and honestly, for me, they are too intricate for coloring in them to be stress-relieving. Some of the mandala-type designs are especially annoying because the little sections actually aren’t discrete, so you end up coloring this huge area that winds through lots of others. I need to just go buy a coloring book for kids! This was my experience too. I actually found it more stressful to colour in adult colouring books so I just gave it up. I totally agree. I plan to pick up an extra $1 child’s coloring book next time I go to Michaels. I feel the same way! I go way back on coloring as an adult – I’ve been doing it since law school 10+ years ago but I like all the available options now. One recommendation is to search for abstract or art coloring books, not ones billed as “adult”. They’re not childish but aren’t as exacting. I had a bunch of those that I still color in, but I do have a few of the newer more detailed ones as well. +1. I thought I would love it but my type A personality took over and coloring in every tiny little space became stressful and I didn’t want to stop until I finished. It still makes me laugh since I bought them for relaxation. +1 children’s coloring books FWT! Agreed. I prefer dot to dot. There is no thinking. Just dots. They are numbered. It is wonderful zen stress-relief. I got a Halloween themed Disney princess sticker/coloring book “for my daughter”…. yeah, but she’s 2, so it’s not like she can actually do it, so I’ll just have to do it for her. What a shame! I agree! I have a ton of unused “adult” ones, including that Fantastic Cities, which is incredibly beautiful, but filled with thousands of tiny things to stress over. The book also doesn’t lay flat very well and it’s massive. I think it’s a perfect book for those who love to color, but not necessarily for stress relief. I wish someone would color it for me though, because it really is beautiful. My newest “adult” ones are really good! “The Mindfulness Coloring Book” and “Color Me Cluttered: A Coloring Book to Transform Everyday Chaos into Art.” The first has intricate details, but it’s very small (perfect for tossing in a bag or keeping at a desk), so it’s not super overwhelming (plus, I love that the subtitle is “Anti-Stress Art Therapy for Busy People). The second is book sized, but has very large coloring shapes. It is also incredibly cathartic that the premise of the book is coloring in an unorganized room of a house. I’m so happy you said this! SAME! I want big spots to colour so I don’t have to think too much. OK, for all of you Type As out there, here’s what I recommend: Buster Color by Numbers (by Emily Golden Twomey), and a set of Brilliant Brush pens. The Color by Number books literally take all stress out of the coloring book thing because they tell you exactly what colors to use, and the Brilliant Brush markers are so tactile and lovely. I knew that coloring would be a stress-reliever for me, and after trial and error, this is the combo that works best. I tried all of the Enchanted Forest-esque coloring books and found them too detailed and intricate. Color by number feels a little lame (it’s the opposite of creative!) but for me, it’s truly relaxing. Yes! That’s why I prefer books like one I mentioned in the post, Color Quest: Extreme Coloring Challenges. You don’t have to make any decisions about which color to fill in certain parts of the picture (which was also stressing me out — “What if it ends up looking like crap?”) because it’s color-by-number! I just bought it on Amazon! Brilliant. This is what I needed to know. Worrying about choosing the wrong colors and having an ugly picture totally stresses me out. I do have to warn you that the spaces to color in are VERY small. But it kind of becomes more of a meditative thing that way — it’s not like you can rush through it and finish in ten minutes or whatever. I’m thinking about doing a Brazilian bikini wax for the first time – what can I expect? is the regrowth itchy or uncomfortable at all? Are there any issues with doing it at lunch and going right back to work? I’d like to do it once just to try it, but I’m not sure if I would want to maintain it (I go for pedicures maybe a few times a year max). You might not want to go back to work right after bc your v might explode. JK. Yes, regrowth can be itchy and uncomfortable. Make sure you exfoliate. Right afterwards, you may have some swelling and tenderness. Hydrocortisone can help with that. Make sure you wear comfortable under and outer garments that won’t rub or irritate the skin too much (I usually stick to looser cotton briefs and a skirt). And also you might get wax on your under garments so maybe not something you really care about. I do it a couple of times a year – mostly in the summer and maybe once or twice in the winter so don’t “maintain.” It’s not a big deal for me. You’ll be fine going back to work. The regrowth can itchy but you don’t notice it after a while. If you are prone to ingrown hairs, most places have creams to help prevent them. They may ask if you want to be waxed between the cheeks. Give it a shot, I find it to be the least painful part. I used to go to a regular salon, and recently I’ve been going to the European Wax Center. I find that their wax formula/technique is the least painful for me. Also, if you have your period or are close to starting you may notice a bit more sensitivity. The first time is definitely the most painful. By far. Subsequent waxes, when done on an 8 week schedule, are so much easier. I suggest taking an Advil before you go. I go to Wax in the City, which is in multiple cities, and they are so much better than anywhere else I have gone. It’s less painful and they do a much better job. I’m a heavy sweater generally and waxing brings out the worst in that. When I wax, I strip from the waist down, I take off my bra, and I wear a shirt that’s just to be worn during the wax. I’ll pit it out so I don’t want to have to wear it for the rest of the day. If this is an issue for you, I suggest bringing a t-shirt with you. Especially if you plan to go back to the office or are wearing nice clothes. You can go back to work, but I agree that you’ll want to wear loose fitting clothing. You’ll be red and a little sore for a day or two. I second the suggestion to embrace the back-side wax. It doesn’t hurt at all and I love the hairless feeling. I find puzzles very soothing, but definitely bit off more than I can chew with a 2000 piece one I got, which also happens to be too big for my coffee table. Does anyone else here do puzzles? Recs for good ones that aren’t enormous? My husband and I do them together and love the Colin Thompson ones (Ravensburger is the publisher). (Search on Amazon for Kitchen Cupboard Jigsaw Puzzle if you’re having trouble finding them.) They’re mostly 1000 pieces, though tbh we prefer the 1500 or 2000 piece ones (which just barely fit on our dining room table). I love puzzles! I always do them with my family growing up and on beach vacations, but somehow never thought to do them on my own (and my now-ex never liked them so I never did them with him). I typically do 1000 piece ones – they are large and intricate to be interesting, but can fit on my kitchen table or coffee table. I like the ravensburger ones. The pieces fit together well (loosely-fitting pieces are the worst!) and they have a wide variety of designs. They can be on the pricey side for puzzles, I think, but I like them. I used to love puzzles! It sounds like fun to get some to do at home but I’m worried my cat won’t leave them alone if I can’t finish and put it away in the same day. Any ideas? There are probably some less expensive ones out there, but just to give you an idea. They work pretty well – maybe a couple pieces come loose but nothing major. When I was younger I had a large piece of felt for this – it came with a elastic Velcro straps and a tube. You did your puzzle on the felt and when you needed to, rolled it up around the tube and secured the felt with the straps. I recently started hiking again. Stomping around on muddy ground is an excellent stress reliever. Am I making a stupid financial choice? I currently work in a fairly low paying (certainly by Corporette standards) field. I’m also working on an additional degree in order to pursue a career that’s tangentially related but substantially better paying. I’ve still got student loans from my initial degrees, which I’m paying off. I’m also paying cash for my education. These two expenses basically decimate my paycheck and are keeping me from socking away much in the way of long or short term savings. My husband and I keep our finances largely separate, but I have access to a joint emergency fund that he, you know, funds. It’s also worth mentioning that he makes roughly four times as much money as I do. It’s important to me to pay for my education myself. Since doing so with cash is keeping me from saving, is it rational to take out student loans to do so? Also, does anyone actually know whether I’d be able to take out student loans based on my income and credit rather than ours? Your financial system sounds totally out of whack – you’re married, the money is joint, however you want to go about writing checks. The fact that you feel like you have “no savings” when you and your husband have a supposedly joint emergency fund is actually kind of sad – like you feel like you don’t have a right to “your husband’s” money, even though the two of you have theoretically signed up to be permanent life partners. I am not sure I could be with someone who left me trying to scrape by on a “decimated” paycheck while he makes four times as much. Is there some reason why it is important for you to pay for your education yourself? If you were my partner, I would be very uncomfortable seeing you put this all on yourself, when it’s something that the partnership could easily handle. For context, I also have finances that are mostly separate from my husband’s (separate checking accounts and investments, with a joint account for house expenses), largely because we like handling our own cash flow and investments. This works because we both have high incomes, so we don’t have to keep track of who pays for dinner, etc. As an outside observer, given that you 1) have a large income disparity, 2) you’re feeling stretched with expenses, and 3) especially because those expenses are for education that is an investment in your joint future, it seems like it would make sense for you both to consider paying for your education out of a joint account, as a joint expense. This. My husband and I keep our accounts separate for the same reasons as anon, except I make a bit more than double as my husband. But I wouldn’t say our finances are separate. My husband has a huge student loan balance and I have no loans, so I pay the mortgage/car payments/some other stuff, and he diverts most of the money to his loans. I couldn’t imagine “collecting” money from him for expenses when I know he is paying for education AND I make more. Your husband may feel the same. Why not talk to him about it? If for no other reason, he needs to know you are making a financial decision that could impact him (negatively) in the future. I have the Secret Garden coloring book – and the other’s in that artist’s series, which I enjoy. Although I always feel like I need more variety in my green colored pencils (no matter how many shades I have!). I also started hand quilting a few years ago as grief therapy. I never really gave it up, although I do it more in fits and starts now. I’ve started drafting my own patterns, which is enjoyable. I prefer hand quilting – very soothing and I can do it curled up on my couch. I read all the books. Ok not all but I read over 100 books in a typical year. I have a few fiction writers that I read almost everything they write and read a lot of nonfiction as well. I also bake. I find it relaxing to bake things I make frequently and fun to try new, challenging recipes. Desperately need an activity/stress relief as I’m the type who goes to work and then just comes home and turns on the TV. Love sports so if one of my teams is playing, great. If not, I end up with 24 hrs news on in the background and me wasting time on the internet – which would be fine if it were rejuvenating but it isn’t. Got into Sudoku for the last few months. Lets see if it lasts. Do you WANT to get off the couch? You could join a sports team or sign up to do a charity run (then practice running). I like cooking. If I had the time… I’d take an art class, painting or drawing and work my way “up” as I hopefully got more skilled (sadly, no innate talent but I’d like to learn). If you want hobbies to do at home, knitting or something like that? Try knitting! or crochet. Once you know what you’re doing, you can knit or crochet while watching TV (although audiobooks are also a good alternative if you want to avoid the TV entirely). I specifically got into knitting because I wanted a hobby that was easy to do in the evening, didn’t make a mess and could be picked up and put down easily (I used to paint eons ago, but that makes a mess and really needs large chunks of time or the paint will dry), and you end up with something useful in the end. I have too many hobbies. Stuff outside/being active-surfing, swimming, running, cycling, weight lifting. Cooking, gardening, canning, and baking. Have done coloring books, but those are usually reserved for flights. I just want to say that I am excited for this series of posts. I read fiction books for fun but I don’t have any hobbies. I don’t know what to say when people ask me what I do when I am not working. Sleeping isn’t really an appropriate answer.